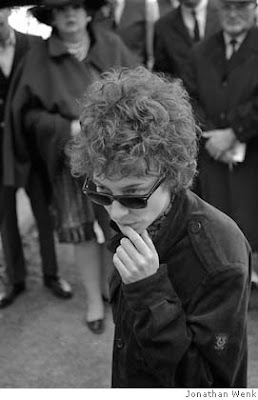 With a topic as elusive as Bob Dylan, I knew going into I’m Not There that in the hands of someone like writer/director Todd Haynes who had given Citizen Kane a glam rock makeover with Velvet Goldmine and let Rock Hudson’s Douglas Sirk characters finally come out of the closet in Far From Heaven, he could not craft a film “so plain.” However, after only a few minutes, it does begin to make us feel “insane,” overly relying on all of our “useless and pointless knowledge” about the man, the myth, the Dylan to try and glean any wisdom from its largely incoherent structure. As fascinating as it is infuriating, weaving in and out of one scene and-- what’s more-- one actor to the next, Haynes introduces us relatively quickly to the six performers who represent Dylan at various stages in his career. Drawing inspiration from Dylan’s countless public personas, evolving interviews, concert performances, films and phases along with the legendary song catalog of the man himself, the script for the film is the initial standout, filled with intoxicatingly evocative imagery that intellectual audiences savor like honey, especially when the dialogue is delivered with such sweetness by its sumptuous cast. In fact, some of the phrases seem so ingenious, they’re damn near worthy of Dylan himself but then again, we constantly ask: just who the hell is Dylan anyway? Sketching various portraits of the man in broad strokes, relying on prior knowledge of the Dylan mythology to fill in the lines, we encounter our Dylans: the young boxcar hopping Woody Guthrie (Marcus Carl Franklin), the Greenwich Village “Troubadour of Conscience” Jack Rollins (Christian Bale), gorgeous “Dean, Kerouac, and Brando rolled into one,” actor Robbie Clark (Heath Ledger), poetic Arthur Rimbaud (Ben Whishaw), press loathing, insecure Jude Quinn (Cate Blanchett) just after Dylan goes electric, and the old cowboy Billy the Kid (Richard Gere). While some argue that there’s a seventh Dylan as Bale’s Rollins evolves from New York City folk singing icon to Dylan as the born-again Pentecostal minister, this change is just one of several chameleon like incarnations since Dylan, as he himself said, can become someone else completely in the course of just one day. Most of the press surrounding the film centered on a richly deserving Cate Blanchett who made headlines for playing a man and she’ll put any fears to rest about “stunt casting” after just a handful of scenes as she masters his mannerisms in ways that defy mimicry. Despite her stunning portrayal, I was particularly struck by both Ledger as the conflicted husband and father as well as an engaging turn by young Marcus Carl Franklin as the mischievous, tall-tale happy youth whose scenes seemed tinged with a touch of gold, similar to the way Hal Asbhy’s biopic on Woody Guthrie, Bound for Glory, managed to inspire awe with its innovative cinematography. However, this praise aside, Haynes’s film wears out its welcome in the final hour after the initial intrigue fades and it becomes far more experimental and nonsensical with each passing frame, quite similar to the way that some of Dylan’s stanzas seem to inspire countless arguments as to their true meaning. Even though Dylan devotees will feel a bit more at home in the narrative than those unfamiliar with the man, I’m Not There spirals into a pretentious vanity project that gets even more preposterous as we journey—for no reason in particular—to the old west with Gere, who nonetheless manages to redeem the segment with a beautiful bookend recalling the opening with Franklin.